Here you will find photographs I have collected capturing the Savoy Ballroom. I am still scanning and uploading many images. You can click on a keyword above the gallery to filter by location or detail. These images are collected for research purposes only and will not be used directly in our virtual reality project. I have listed the date, photographer, subjects, image source and given a source link whenever possible. Establishing complete records for each image is an ongoing personal project. If you have additional information about an image or can provide a higher resolution version, please contact me! 1928 – Bennie Carter & His Savoy Playboys On The Savoy Ballroom Bandstand. Source: Unknown. C.1930 – Dancers At The Savoy Ballroom With Chick Webb & His Orchestra On The Bandstand. Source: Photograph By Berenice Abbott, Getty Images. C.1930s – Gertrude Hadley Jeannette & Joe Jeannette II Sometime In The Early To Mid 1930s. Source: Unknown. 1937 – May 11th Gene Krupa Playing With The Benny Goodman Orchestra In The Legendary Battle Of The Bands With Chick Webb’s Orchestra At The Savoy Ballroom. Source: Unknown. 1938 – Marquee Advertising Maple Leaf Pinochle Club Lindy Hop Contest. Source: Photo By George Karger, Pix Inc For LIFE Images Collection/Getty Images. 1939 – Savoy Ballroom Marquee In The Day Time, Original Colour Photograph, Not Retouched. Source: Unknown. Undated – External View Of The Savoy, With Marquee Advertising Lucky Millinder & Dizzy Gillespie Orchestras. Source: Unknown. Undated – External View Of Savoy Ballroom From Corner Of Lenox Avenue & 140th Street. Source: Unknown. 1940 – Cootie Williams Playing With The Duke Ellington Orchestra. Source: Frank Driggs Collection, Corbis. 1941 – Wide Angle View Of The Savoy Ballroom Dance Floor, Bandstand And 140th Street Rear Corner. Source: Unknown. 1941 – Ella Fitzgerald Orchestra On The Savoy Bandstand. Looking Towards The 141st Street Rear Corner. Source: Frank Driggs Collection, Magnum Photos (reference PAR60315). 1944 – Savoy Ballroom Marquee In 1944 Advertising Luis Russell’s Band. Source: Photo Courtesy Of The Frank Driggs Collection. Mid-1940s – Cootie Williams’ Orchestra Including Butch Ballard On Drums. Source: Peter Vacher Collection. C.1946-1948 Dizzy Gillespie’s Orchestra On The Savoy Bandstand. Source: Photo By William P. Gottlieb, Library Of Congress. 1947 – May 1947, Dizzy Gillespie. Source: Photo By William P. Gottlieb, Library Of Congress. 1947 – Underside Of The Savoy Ballroom Marquee. Source: Hulton Archive, Getty Images No 3208894. 1948 – Hal Singer Playing With Lucky Millinder Orchestra. Source: Photo By Gilles Petard, Redferns Collection, Getty Images (ID 131964798). C.1950s – External View Taken By Austin Hansen Sometime In The 1950s. Source: Schomburg Center For Research In Black Culture, NYPL Image ID 1702781, Courtesy Of The Estate Of Austin Hansen. 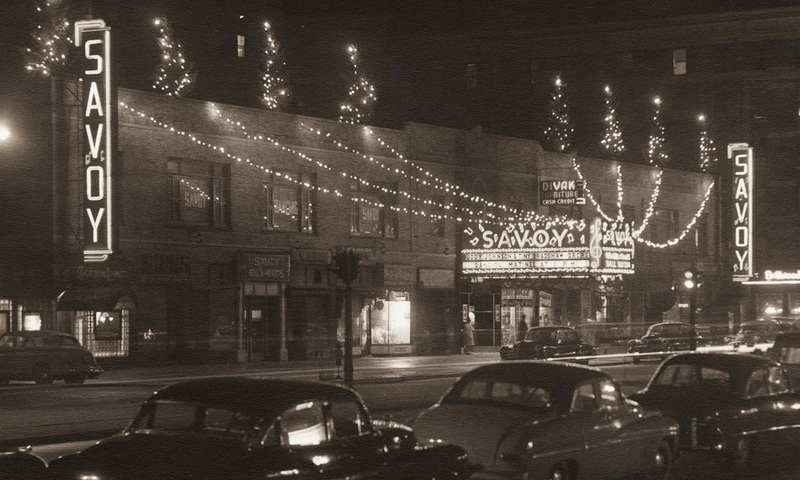 C.1950s – Savoy Ballroom Marquee & Entrance Circa 1950s. Marquee Advertising Buddy Johnson & Lucky Thompson Orchestras. Source: Unknown. 1952 – Crowd Outside The Savoy In 1952, Marquee Advertising Erskine Hawkins & Terry Gibbs Orchestras. Source: Bettmann Collection, Getty Images 514880892. 1953 – Shot Of The Savoy Ballroom Marquee. Source: Jet Magazine, 20th August 1953, P61. 1953 – Count Basie’s Orchestra On Stage At The Savoy Ballroom. Musicians: Eddie Jones, Frank Wess, Gus Johnson, Ernie Wilkins, Freddie Green, Marshall Royal, Reunald Jones, Frank Foster. Source: Frank Driggs Collection, Magnum Photos (reference PAR60147). 1958 – Leaving The Savoy With Purchased Furniture After The Closing Down Auction In 1958. Source: Jet Magazine, 16 Oct 1958, P60. 1936 – Dancers In Front Of The Bandstand. Dancers Names Unknown. Source: LIFE Magazine 14 December 1936, Photo By George Karger.